Spring 2005 Corporate League Tennis finished on a High Note! 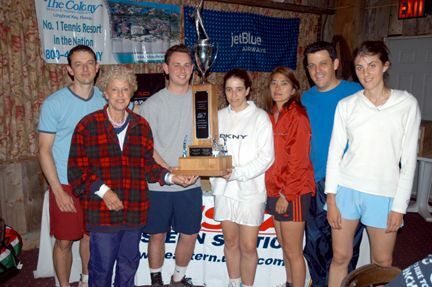 On May 19, 2005, Corporate League Tennis presented by The Colony Beach & Tennis Resort, JetBlue Airways, and Head/PENN wrapped up the spring season of the corporate league and all teams were finished in top form. Credit Suisse First Boston defeated 4-time champion Goldman Sachs to win the "A" division title. Credit Suisse First Boston dedicated the win to their long time captain Jacek Wojtowicz who was unable to see his team be victorious due to circumstances beyond his control. The "B" division championship match was extremely close, but in the end Thomson Financial beat Societe Generale by five games. 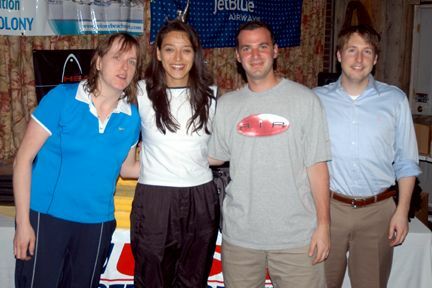 Once the matches were over everyone enjoyed a BBQ at Tennisport and then waited for the long anticipated raffle for the grand prizes provided by the Colony Beach & Tennis Resort and JetBlue Airways. Tamayo Mollenthiel of Credit Suisse First Boston won the 5-day/4-night trip to the Colony Beach & Tennis Resort with airfare provided by JetBlue Airways for 2. The pair of JetBlue Airways tickets, good for roundtrip travel from New York to any destination JetBlue flies, was won by Jun Tsuchiya. Thank you to all team captains for managing your teams with precision this season and a special thanks to Tennisport for accommodating all court requests and hosting a great end of season party. For information on how you can enter a team in USTA/Eastern-Metro Region Corporate League Tennis contact Lara Schneider (914) 698-0414x16 or lara@eastern.usta.com.